maxon motor: With the EPOS4 series, maxon is offering a reliable and extremely versatile platform of high-performance motion controllers. It addresses the needs of system integrators and fulfills the requirements of a variety of applications, such as industrial automation, apparatus engineering, and robotics. The platform is now being complemented with two new Compact EtherCAT models. The highly successful EPOS4 positioning controllers made by maxon motor are scalable and consistently support a uniform set of functionalities and connection options. Modularity with different designs (module, compact, or encased version) ensures optimal integration in a wide variety of applications. The controllers offer excellent dynamic properties, control quality, and power density while requiring only minimal installation space. In addition, their automatic controller setting makes them ideally suited for easy control of both brushless (BLDC) and brushed DC motors. 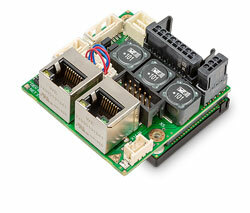 maxon is expanding its family of EPOS4 products with two new EtherCAT Compact controllers (24/1.5 and 50/5). At the same time, maxon is upgrading the capabilities of the entire platform by enabling dual loop control. Dual loop control simultaneously controls motor and load feedback for optimum performance within the system. The EPOS Studio software ensures the minimum possible set-up times with its automatic Regulation Tuning feature. However, the EPOS4 has many additional capabilities: for example, the controller continuously delivers hundreds of data points about the drive system for online condition monitoring and transmits this data to a higher-level system via CANopen or EtherCAT in real time. This supports complex predictive maintenance systems that anticipate impending failures to avoid costly repairs, resulting in higher productivity and lower cost.